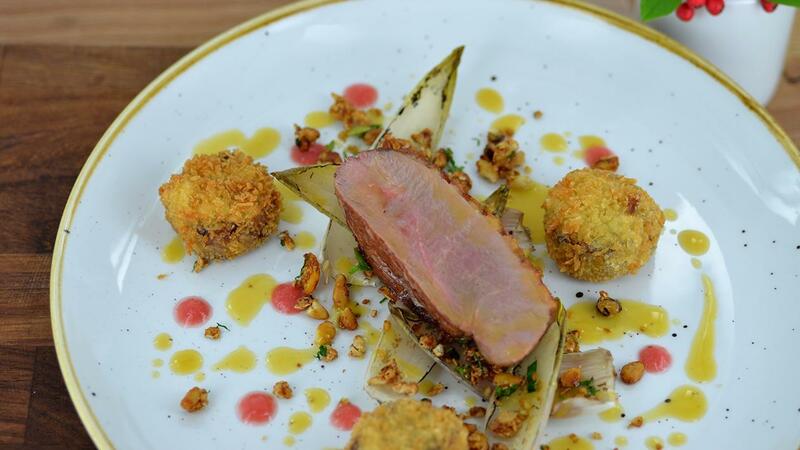 Try our easy pan fried duck recipe - a perfect alternative to classic poultry dishes. Place the duck leg thyme, garlic and stock into a deep pan, cover with foil and roast for 3 hours at 140ºC then remove and allow to cool slightly then flake the meat from the bone. Mix some of the cooking liquid into the duck meat then allow to chill along with the cooking stock. Once the duck meat is chilled, roll into balls then pane and chill until needed. Roughly chop the nuts the mix with the oats and honey then bake at 160ºC for 10-12 min. or until slightly golden. Remove and mix in the lemon zest then set aside until needed. Bring the rhubarb, star anise, sugar and water to the boil and cook for 5-6 min. then remove the star anise and blend until smooth. Pass through a sieve and place into a squeezy bottle ready for service. Peel the leaves from the endive the sprinkle with the sugar then blow torch until slightly charred. Season the breasts then pan fry the skin side down for 4-5 min. then turn over and transfer to the oven. Cook for 4-5 min. at 180ºC then remove from the oven, cover and allow to rest. Once rested slice the breast in half. Drain of any excess fat from the pan then return to the heat and deglaze with the orange juice and add the stock from the legs. Deep fry the croquettes until crispy then place half the duck breast on to the plate then add the charred endive, rhubarb puree and spoon over some of the sauce. Sprinkle over the granola and place on 3 croquettes.